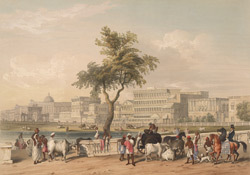 This coloured lithograph is taken from plate 23 of Sir Charles D'Oyly's "Views of Calcutta and its environs". The Esplanade was made by clearing away the jungle around Gobindpore, the most southerly settlement of Calcutta, to build New Fort William in 1757. Initially there was a prohibition on building on the levelled Esplanade on either side of the fort, this was so that nothing would obstruct the line of fire. However, the clearing of space facilitated construction. Esplanade Row was the street marking the southernmost part of the city, and was itself the northern limit of the Esplanade. It was home to many impressive public building. Government House, the governor-general's residence, and one of the three tanks (reservoirs) can be seen in the view.